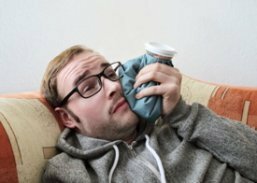 If you've got a toothache, home remedies can seem attractive. But toothache home remedies are usually a temporary stop-gap to see you through until you can get to a dentist. 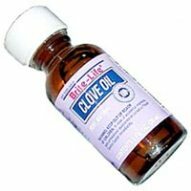 One of the favorite home remedies for toothache is clove oil. For toothache pain, however, you will need to see a dentist eventually! But what toothache home remedies are there, that might buy you some time? Maybe you're in a strange town, or overseas on business, or just plain so busy with stuff in your life that you can't get to see a dentist for a day or two. Or longer. For my FULL GUIDE to toothache pain relief, check out my toothache e-book at Toothache Survival Guide. It's FULL of information all about toothache causes and what you can do at home to get some relief, for just $9.95 to download! If you have a toothache like a constant dull throbbing, that a hot drink makes worse, try rinsing gently with cold water. The cold can really take the sting out of the ache. But you'll need to keep a bottle of cold water in your hand and keep rinsing out every few minutes. After an hour or so, the pain should settle down for a while, giving you the chance to try some of the other home remedies for toothache here. If you can identify which tooth is aching, and you can feel a little hole, you could try a small amount of clove oil. For toothache, it's pretty effective, but doesn't last long, and it has a very strong taste! The best thing to do is this: get out your clove oil, and some cotton wool. Tear off a little piece of cotton wool, and roll it into a ball. Now tear it in half. You only want a really small piece of cotton wool. Then, dip the small bit of cotton wool into the clove oil. Now the tricky bit. First, rinse out your mouth vigorously with water, really swishing and sucking around the tooth, to wash out the cavity as best you can. You want to try and clean out any food debris left in there. Use warm water if your tooth is sensitive to cold. After swishing out and spitting out, try to put the little cotton wool ball into the cavity. You may need to put it on the tooth with your fingers, then use your tongue to push it into the cavity. If you can do this, it will help to settle the tooth down for a while. As an extra step to putting cotton wool soaked in clove oil for toothache into the cavity, you can seal the cotton wool in place with a little bit of chewing gum. If you're going to do this, you have to chew a piece of chewing gum first, and get it nice and squishy. Now take it out of your mouth, and tear off a small piece. Now follow the instructions above for the clove oil. Once you've done that, pick up your little piece of chewing gum, and try to put it into the cavity, over the cotton wool. Again, you may need to use your tongue to get it into place. Then you can bite down on it to push it all the way it. This will also help to protect the tooth against hot or cold things that might set it off. This chewing gum trick is also useful if you have broken a tooth and have sharp edges or food packing. You don't need the clove oil in this case, just put the chewing gum straight over the broken bit. Try to use less than you think you need. Most folk use too much, and it keeps coming out. Try a smaller amount - you can always add a bit more on top! If you have a swollen gum, either around a wisdom tooth or around any other tooth, rinsing the area carefully with hot salty water can help. BUT you have to do it almost every hour for it to work. Just put a small spoonful of normal salt into a cup of quite hot water, and then take a small mouthful. Swish it forcefully around the sore gum, to wash out any food debris that might be packed in there, and then spit out. Do it again. Do this 4 - 5 times, then stop. Repeat the whole thing an hour later. If you can keep this up, it usually helps the gum to settle a bit. The opposite is true if you have a swollen face. Never put any sort of heat pack on the outside of your face, unless directed by a doctor or dentist. This is the"toothache Home Remedies" guide, remember! For home use, always treat a swelling of the face with an ice pack. The quickest thing to hand is usually some sort of bag of frozen vegetables out of the freezer, like a bag of frozen peas. Only apply it over the swollen area for 10 minutes, otherwise you can cause ice damage to the skin. Wait 20 minutes before applying it again. Painkillers. These can be divided into non-prescription painkillers that you can buy over the counter, and prescription painkillers that obviously need a prescription from a doctor or dentist. Still, for a quick remedy, it can work remarkably well, especially if you combine it with the clove oil for toothache trick as outlined above, sealed in with chewing gum. For prescription painkillers, you will need to see a doctor or dentist; they will be able to examine you and recommend the best painkiller for your particular situation. I hope these toothache home remedies might be of some use as a temporary "help". If one of them gets you through a difficult day or two, that's great. But no home remedies for toothache will solve the problem for good. You will need to see a dentist for that!